WEST LAFAYETTE – Tanner Andrews has looked forward to every Friday this baseball season. The Purdue senior has even more motivation for this Friday to arrive. 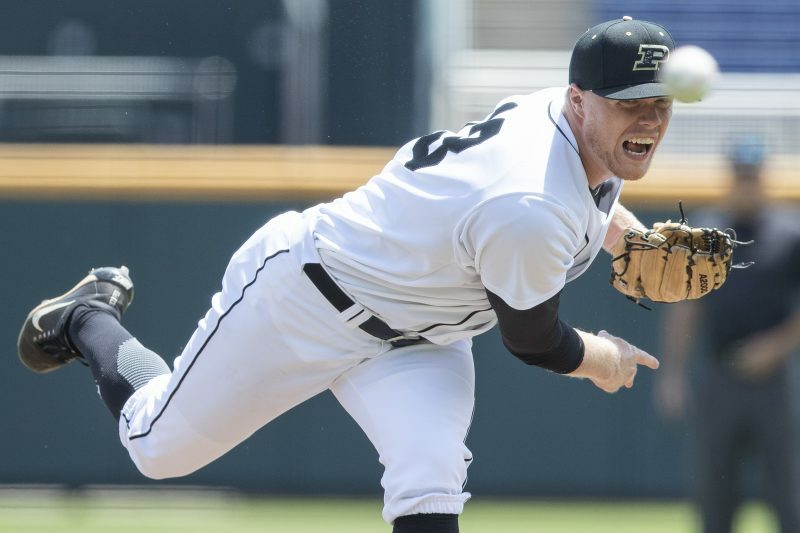 Andrews, the ace of the Boilermaker pitching staff, will be handed the baseball on Friday night to lead his team into the NCAA Tournament. Purdue will face Houston in the Chapel Hill Regional as the program makes just its third appearance ever in the Big Show. Andrews, the former three-sport star at Tippecanoe Valley High School, relishes the opportunity in front of him and his teammates. Andrews and his teammates watched the NCAA Selection Show Monday to see where the Boilers would play in the 64-team field. The squad finished runner-up in the Big 10 Tournament, losing 6-4 to Minnesota in the championship game on Sunday. Andrews was a team MVP and All-Three Rivers Conference as a star in baseball, football and basketball at Valley. His father Todd played baseball at Grace College. 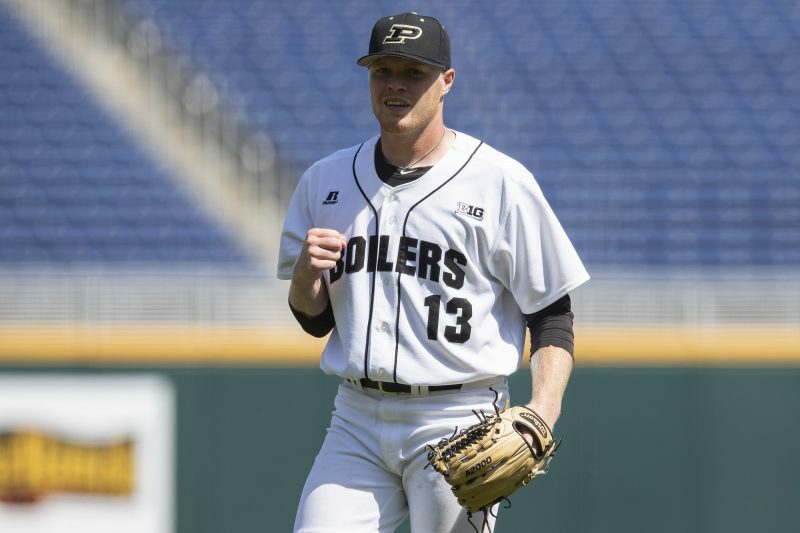 The Boilers have come miles the past two years under coach Mark Wasikowski, who was hired in June of 2016 after spending 20 years as a highly-respected assistant coach at various programs. Purdue was 10-44 overall and 2-22 in Big 10 play in 2016. The team improved to 29-27 overall and 12-12 in league action in 2017. The Boilers now sit at 37-19 overall and went 17-6 in conference play. The squad is 21-3 in its last 24 games. “It’s just been a lot of fun and really special to be a part of this,” commented Andrews. “It’s been such a rewarding season. Andrews, a 6-3 220-pound right-hander, has definitely gotten better. He was 0-0 with a 5.06 ERA his freshman season. He then went 2-6 with a 3.53 ERA as a sophomore before posting an 8-4 mark with a 4,52 ERA hist junior season. Andrews, who earned Third Team All-Big 10 honors, has saved his best for last. He is 7-4 on the hill this season with a 2.71 ERA in his 15 starts. He leads the Boilers in wins, innings pitched and strikeouts. Andrews was also named to the Big 10 All-Tourney team after picking up a win over Ohio State last week. He will be named soon to the Academic All-Big 10 team in honor of his work in the classroom where he carried a 3.17 GPA. He has also responded in a big way after being hit in the head by a line drive in an intrasquad scrimmage two falls ago. Purdue, which appeared in the NCAA Tourney in 1987 and 2012, will play Houston (36-23) at 7 p.m. Friday in the double-elimination regional. The Friday opener pits top seed and sixth-ranked North Carolina (38-18) versus North Carolina A & T (32-23). The regional winner advances to the Super Regional June 8-11. The College World Series begins June 16 in Omaha. Andrews also has to be looking forward to next week. The 2018 Major League Draft is set for Monday through Wednesday with Andrews expecting a chance to further his career on the next level. “I’m blocking all of that out,” said Andrews of where he may be drafted. “I have an adviser who handles all that stuff for me. And at least one more Friday night to shine under the lights. Tanner Andrews leads the Purdue pitching staff in wins, innings pitched and strikeouts.